NSE started the concept of pre-open session a few months back to minimize the volatility of securities during the market opening every day. Between 9:00 AM to 9:15 AM is when the pre-market session is conducted on NSE. During the pre-market session for the first 8 minutes (between 9:00 AM and 9:08 AM) orders are collected, modified or cancelled. You can place limit orders/market orders. After 9.08 AM to 9.15 AM no new orders can be placed, orders placed are matched and trades confirmed. So technically you can place orders only for the first 8 minutes and only on equity segment. More on Pre-market orders on this link. Similar to pre-market orders, post-market orders are allowed only for equity trading. The post-market session or closing session is open from 3:40 PM to 4:00 PM. During this session, people can place buy/sell orders in equity (delivery segment using the CNC product code) at the market price, but do note that even if you place a market order it will be placed on the exchange at the closing price. So for example, if the closing price of Reliance at 3:30 PM is Rs. 800, between 3:40 PM and 4:00 PM, you can place market orders to buy/sell Reliance at market price (will be taken at Rs. 800). Post-market session is not very active and you can look at the movement of stocks by opening the marketwatch window from 3:40 PM to 4:00 PM. This facility is available on Zerodha for people who can’t actively track the markets from 9:15 AM to 3:30 PM. You can place orders any time from 3:45 PM to 8:57 AM for NSE & 3:45 to 8:59 AM for BSE (until just before the pre-opening session) for the equity segment and up to 9:10 AM for F&O. So you could plan your trades and place your orders before the market opens. After-market orders can be placed on all the exchange segments. Please note that if you place any after-market order between 9:15 AM and 3:45 PM, they will be rejected. AMO is allowed only between 3:45 PM and 8:59 AM for equity and up to 9:10 AM for F&O. For currency derivatives, AMO is allowed from 3.45 PM the previous day to 8:59 AM only. After-market orders are also allowed for commodity trading. After-market orders for commodity can be placed anytime during the day, orders will be sent to the exchange at 9:00 AM (MCX opening). So if you place an after market order at 8:59 it will get sent today and if you place it at 9:01 AM it’ll get sent tomorrow. If you are looking at getting the best fill first thing in the morning, placing a market order at opening is a much better idea than using AMO. We typically have thousands of orders as AMO, which are sent together to the exchange at market opening and this might take a few seconds for the orders to be placed. AMO is a feature mainly for the investing community, who can’t get online during market hours. Hmm.. u should be able to cancel the order. send an email to [email protected] with ur client ID. Ichimoku is already available on Kite. Punit, currently SL orders in AMO is deactivated. We should have it up soon. The reason for this is because we send AMO’s at 9 AM. Exchanges don’t accept trigger orders at that time. When AMO Stop Loss facility will be up, it is very inconvenient. Hi.. Has the Stop Loss option in AMO enabled now. The last update in September said it was said that the feature would be available. Milind, SL AMO orders are now allowed. I am also not able to place limit order on amo and am forced to sell on market rates on off markets which is not fair. You can place a limit AMO. What error do you get when you try to place? There is only limit and AMO to place orders after and before market opening and closing. Kite has not worked for that in sell as well. Any comments and resolutions on that. Your support directed me to this link instead of resolution, your sales also directs to website. ZConnect,analysis is not easily available in kite. Can you be clearer with your query? Hey Sumit, all the pending orders on the exchange are cancelled at the end of the day. The exchange does not maintain orders overnight. That said, we are working on a mechanism to provide long-lived orders. This will take some time though. Until then, I’m afraid you’ll have to place orders each day. Alternatively, you can place AMOs every evening. Waiting for Long-Lived order to come into zerodha. Please update once this is live. What i understand, Limit Sell is sell at any price above the limit. You placed limit sell at at 88 and share got settled at 93.. Higher selling price is better right? Can orders placed through AMO be cancelled during trading hours on app? Or we are supposed to send mail to do the same? This not only with few people it always happens with everyone, those try to place order but when ever u call zerodha for any technical issues they always had one answer send a email to support @zerodha.com now already stop to call them and stopped email them even after email they generates ticket and then keep waiting for u r train to come it’s really poor when it comes to zerodha support. One more thing u will find info on what is pre market order. But I never see step by step information how to place a order in zerodha during 9 am to 9:08am. If u given that’s information step by step pls share. Yeah the order will be valid till end of day. If you have placed it at 100, you will get it as soon as the price reaches 100. AMO is closed price of previous day or opening market price?????? Srikanth, the orders will be sent to the exchange at 9 AM and will be executed after the market opens if the price matches. Srikanth, your order will be executed if there is a match, if not then all orders are cancelled at 4 PM. 1Mkt or limit & ,if limit then at what price- stateway less 10% of today close(166.75) eg 150.10. I am also facing the same issue, have you found solution ?? There’s not much that can be done in the case of these stocks except for placing orders each day until it is executed. SL is very confusing for me. I am new to this. if I have 95 and I put stop lose of 10 then it should be 95 but your video says 105???? How is that even possible? it is going in reverse??? What is the error you’re seeing? Yes Madhu, AMO can be placed as limit and market, the important thing to know is you cannot modify between 8.45 to 9.15. AMO can’t be placed during the trading day. Y can’t i use AMO order on Zerodha web base. Y do i need to only have software to place AMO orders. AMO is available on the web based version and the HTML5 version. Under Trade on trade express there is an option for AMO and you have a tick box option while trading on Z5. When AMO order get executed and at which price ??? All AMO orders are sent to the exchange after market opening. They will execute based on the current price at that time. Is that 9:00am or 9:15am? Market and Limit equity orders are sent at 9:00 and everything else at 9:15. PRE-MARKET/POST-MARKET/AFTER-MARKET ORDERS can be placed for nfo (futures)? Is there any price band limit for AMOs on Zerodha? e.g. Kotak Securities has +/- 10% of the closing price as price band limit for any scrip; I have account with KS, but not able to grab the opportunities because of this limitation. Now I am looking for better service, hope you can help me. Order can be placed at any rate, however the Exchanges prescribe an upper and a lower circuit limit within which price the order can get traded. You can open snap quote window to know the upper/lower circuit rates. Prices outside this range will not be accepted. If placed outside range, order will get rejected on submission. What is the purpose of Post Market Session at NSE? whats the meaning of portfolio and pivot points? Santhosh, if you have questions to be answered, send them as an email to [email protected] and we will make a blog on them and answer it to you..
why they use AMO MARKET? After market orders(AMO) is usually placed by people who don’t have access to the markets during normal trading hours. For example, if you are a software engineer who can’t access the trading platform during the day, you can place limit orders the previous evening itself using AMO.. I would like to know on what basis would my order be prioritized when i place an After Market Order (AMO). For Example i place an AMO at 7:00PM on one day, at what time would it be released to the market the next day? Suppose there are other people who have placed AMOs for the same stock at the same price then on what basis these orders be prioritized for execution? Also I have seen other brokers allowing us to place AMOs from 3:30PM itself however Zerodha allows us to place orders only after 6:30PM of the trading day. Please let me know does this in any way affect the priority of my order during execution? Is AMO applicable to FNO also? @ Sukesh, what time you place an AMO has no significance on the priority in which your order is executed. As soon as the market opens at 9.15am, all the AMO orders are sent by the broker end. If you are looking at AMO to get the best rate in the first 1 minute of the market opening, it is not the right tool. AMO orders are mainly for people who don’t have access to market during trading hours and want to place orders to enter and exit. If the objective is that it is better that you place an order yourself as soon as the market opens. 1. Suppose i want to purchase A nifty lot only if market opens above say 6000. What is the best order i should use? 2. Does your mobile application and you web application supports PMO and AMO as i dont see any such order there please clarify. Zerodha I beg to differ my friend has placed AMO order in F&O and successfully executed it. a app to be released on Apple market…. Nitin, can u please provide an app for the iPad…. Can you try installing the IOS app, works better. We are working on native IOS apps, will take time. Yeah the iOS app is only available for the iPhone and not the iPad. The app gets the job done but nothing more nothing less. If you have time , please do take a look at the IIFL iPad app… So beautiful and so polished. But before any of this, I have to thank you for taking the time to reply for every comment… It is truly amazing to get the reply from the CEO himself giving people so much trust in you guys at Zerodha. Thank you very als don’t forget to take a look at the IIFL iPad app.. Yes Kishore, building a native app for iphones and ipad is on our list of things to do. If i have shares already in my demat account suppose which was purchased few days back,Can I sell the same in the post-market session or closing session which is open from 3:40 PM to 4:00 PM in any of the exchange bse or NSE. Any another way to buy BSE stock or NSE stock in Premarket which is not included in F&O Segment? You can just place a regular order between 9:01 and 9:07. I would like to know more about cover orders.Can it be placed in all segments.Also can it be done outside market hours. http://www.zerodha.com/z-connect/blog/view/cover-orders-for-higher-leverage for more on cover orders. You can presently place them on equity, f&o and currency. This is an intraday product where you have to buy/sell market, so not possible to be done outside market hours.. Do check the blog for more..
Do we have to place after market order in currency after 5.30PM And before 6.30 Pm.Please mention the correct time in now System. Shashank, What we meant was that you can place AMO orders anytime after 6.30pm till the markets open the next day… Cheers..
Hi, sir if I place any order in post market between 3.40pm to 4.00pm when would it be executed? It will be executed immediately. Between 3.40 to 4, you can place only market orders and all buying/selling will happen at the closing price of the stock. You can place only in equity segment and only delivery trades(using product type as CNC)..
Mukesh, pre-market is different. During the pre-market session for the first 8 minutes (between 9:00 AM and 9:08 AM) orders are collected, modified or cancelled. Empire, it is presently possible only for trading commodities where you can choose an order to be either Good till date or Good till cancelled. Not possible on equity, you would have to cancel and place a fresh order again. Why is there such a restriction ? It is very difficult to put a order everyday, for fear we may not be able to place the order on time for the early markets. Other brokerages like sharekhan, do provide this option. Is there a reason or plan for zerodha to provide this option? We’re doing something to address this. We’ll keep you informed. I’m new to Zerodha. Would like to know if u have any plans to provide features like ICICI direct’s VTC(order valid till cancel) and cloud order where we can store orders. I am a long time investor and following around 40 stocks, so it’s not an easy task to create order every time. without these features, It will be very time taking. On our list of things to do, will take some time. I am frustrated now by placing ‘Stop loss order’ every day. I have 18 stocks in my portfolio and you can understand how much it’s difficult for me to do a monotonous thing every day at least in this tech era, need a permanent solution. A couple of other users already raised same concern in past. I am a software engineer and don’t think Zerodha tech team really needs years to develop this feature. This is very simple ask from us like a small investor who is handling their portfolio by themselves. Thanks . please help to resolve this asap. Being a long term investor, i just want to put a order for long duration, without worrying about every day stock disturbances. Is there a update on this one , it is a good feature ? Currently NSE cancels all un-executed orders after market closing. We are working on providing this facility, it’ll take some time because of the complexity of the required feature. Not yet. We’ll keep you posted. First thanks for providing such discount brokerage. I am eagerly waiting for GTC (Good till Cancelled) order for a long time as a long term investor. I have been a IIFL customer for years but planning to switch my broker now. IIFL provided this facility (known as VTD) for some time but just noticed that they are withdrawing this awesome feature. It gives me impression that brokers/exchange themselves don’t find it good their interests and trying to get away from it. But, being a pioneer and innovator of such a business model, i would expect zerodha to introduce this feature by enhancing their software even at some premium charge. All your software need to do is to carry forward and schedule all unexecuted orders for day as AMO for next day. As of now, I am aware of ICICIDirect and Kotak Sec providing this feature. On our list of things to do. Hopefully in the next few months, it is not as easy as placing the pending as AMO for next day. There are small operational issues. 2. Having orders saved and loaded to AMO or directly in Market (CNC) whenever required. E.g. ICICI direct has Cloud based orders which can be downloaded and sent to the exchange. Would like to know your feedback. 1. Working on it, tricky because exchanges don’t support GTC and we will have to build a layer. 2. We already have AMO orders, that can be placed anytime for the next day. Any updates on GTC order? Any update for GTC / VTD orders? Is it mandatory to have a demat a/c for post market orders as the product type is CNC. If not then how can someone place a post market order and is there any leverage? post market window is open only for 20 minutes and you can’t do any leverage trades. Yes you would need a demat account mapped to your trading account to participate. sir, when i placed AMO in commodity segment ? nice information. I have small doubt. Pre market timing is from 9.00am to 9.08am and in the same time i can also place AMO(After Market Order)? If yes, then how do place order’s for it?? Suppose if i want to place a but order for reliance 10 shares by 9.02am…. then how do i place an order.. is it like ctrl+f1(AMO) or nowmal F1 buy order entry?? During the pre market time between 9 to 9.08 am, you can place orders normally, the same way you do when market is open using the F1/F2 window. You can continue placing AMO orders till 9.15am using the Ctrl+f1 option. 1.On next trading day @ 9.15 AM ,RCOM is open with a Gap up of +2.00% and its moving to +4.00% difference.. In this scenario,whether my AMO orders will get executed at 9.15 AM? 2.RCOM is opening without any gap in its price @ Rs.100.00,whether my AMO order will get executed? 3.RCOM opening with a gap up of +2.00% and coming down to my AMO order price after 9.16 AM,whether my AMO will get executed or not? 4.RCOM opening with a gap down of -3.00% ,whether my AMO order will executed or not? 1. Your order will be remain pending at 101. 4. Yes it will get executed, at whatever is the opening price. I want to buy xyz who’s ltp is 100, in AMO at a price of 102 as I’m bullish on the stock and I’m willing to go up to 104 and not more than that . But the stock opened at 106 and I don’t want to risk the trade at that high price. Now my question, Is there a way to place an AMO with max price that I can go upto rather than going with the market price? Yes, just place a limit price at 104. So it will act like a market order with a max cap of 104. And i am not online user so i can put order in AMO with the help of SL and SL-M? In the video it says to select PCode as-CNC for trading delivery (Interday trading),MIS for Intraday square up trading and NRML for F&O trading.But I dont have CNC option at all in my profile,just have MIS and NRML. As I dont much do Intraday trading and not at all do F&O,It doesnt seem to be useful for me without CNC. Please help me on this. For doing CNC trades in equity, that is to buy stocks and hold it overnight you need to open a demat account with us along with your trading account. If you have opened the demat account and it is not showing up, will have it fixed, but if you want to open a demat account also, shoot an email to [email protected].. I would like to know is there any leverage for after market orders. Using after market orders, you can place MIS, CNC and NRML orders. MIS is a leverage product, and you can use after market orders to place this..
I’m new to Zerodha. Please let me know the procedure to get money from linked bank account to Zerodha trading account.I have linked Canara bank account with Zerodha. We don’t have an instant payment gateway for canara bank, so you will have to do a NEFT transfer from your bank account. The account details are mentioned on this page: http://www.zerodha.com/funds-transfer , NEFT can take upto 6 hours for the funds to show up in your trading account. Premarket orders that you place between 9 to 9.08 is placed on the exchange, whereas AMO is sent to the exchange at the market opening. So if you are looking at getting an execution in the opening few ticks, Premarket orders are definitely much better option…. 1. Can pre market orders be placed for fno also? 2. Since during per market time, numerous people post their orders. At what priority orders are executed when markets open? 1. Premarket orders can’t be used for fno, it is allowed only for equity trades. But you can use AMO orders for FNO. 2. Orders are executed based on price and time. So if 2 people but an order to buy a stock at same price, the person who placed it earlier is filled first. pl. let me know ,how to check open posiotions and margines blocked through nest trader? Can i palce AMO buy and selling order’s in same time in commodities ? Suppose the closing price of Gold-M is 26,982 i expected rise in next day open price, is it possible to place buying order @ 26893 and selling order @ 27000 i mean how the order’s is exectued individually or as different order’s ??? You can place AMO orders, 2 different ones for buying and selling at prices you have mentioned. They are considered as different orders .Whatever price comes first, that order is executed and the remaining will be pending. pl. let me know the advantages and disadvantages of trading with the start of the opening bell that is exactly at 9.15 A.M. and then exiting out at or before 11 a.m.? I think we can pick up the initial support prices to enter in this way. Does Zerodha provide single trading platform for equity, currecy and commodity. If yes Do we require separate margin. Equity and currency can be traded with single margin, but commodity would need separate margin. thank you sir for the timely and valuable advice since i was saved from a ridiculous situation today itself. I am from jharkhand . what will be stam duty fo me? Presently, Stamp duty will be according to Karnataka Stamp act. 0.01% with a maximum of Rs 50/contract note. Sir can I change my email id and mobile number by loging in zerodha back office without filling and singing any physical form. Yes, you can change it by logging into your backoffice. I have an order placed in the system as a stop loss , which i am trying to cancel after hours. however i am getting an error cancellation failed. We work till 4pm on Saturday, between 8.30am to 11.30 pm on weekdays. Guess your issue must have been sorted. Please let me know if for equities, Zerodha allows stop loss orders during AMO. For eg. if Reliance closed the day at 872 with a high of 880, can I place an order specifying that Reliance should be bought if it goes beyond 880 with a limit of 890 at 9 pm in the night for tomorrow’s trading or has it got to be a limit order only. I am in the process of opening a trading account with Zerodha and would also like to consider Zerodha for the demat account if stop loss orders are possible during AMO. My current broker ICICI only allows limit orders during AMO. Yes you can place limit, market and stoploss orders in AMO. If reliance is trading at 880 and if you want to place an AMO order to buy only if reliance goes to 890 which is higher than the market price you need to use a buying stop loss order with a trigger price of 890. Check this blog on Stop loss orders. But yep the facility is definitely available. Can we post pre-market orders during weekends? How can I create a basket order of limit orders and submit it during the weekend to trade on Monday? How can I increase the chance of execution if it is illiquid small caps i.e. can I execute an algorithm? Sorry, I don’t mean pre-market order, I mean after market order (AMO). Yes you can place basket orders as AMO. Go to orders and trades, After market order and then click on basket order. To be able to use execution based algo’s you will need to have a dealer terminal and is not possible on retail client terminals. EDIT: Effective 1st December 2014, the Basket order for AMO has been withdrawn. Thank you for your reply. Appreciate it. Any plans of making the algorithm available to retail customers? It would be really helpful for small / midcaps. In the meantime, what do you suggest to retail traders buying small / midcaps. How can we acquire positions without too much impact cost? I have heard market orders are risky; if I put a limit order for 1000 shares, will it automatically buy in lots of 100 or will it show a bid for 1000 shares on the market? We do have algos for better execution of orders, it is called i3, check this blog. Presently i3 is allowed only for dealer terminals and unless you are someone who trades very big quantities, it doesn’t make sense to subscribe for this product. What you could do is use the disclosed quantity feature while buying and selling stocks. In your buy/sell order window, if you want to buy 1000 shares, mention quantity as 1000 but disclosed quantity as 100. This way on the market depth window only 100 shares will show up, but actually your order is for 1000. Placing market orders on illiquid mid/small caps can be pretty risky. Sorry to post this question here, not sure where it should be placed….anyway, Where is the option to see the Index (Historical and Intraday) Chart, for especially NIFTY (SPOT)..
You can look at the charts for only what can be added on the marketwatch. So you can look at the nifty futures historical chart by adding nifty futures on the chart. But you cannot add the chart of the underlying nifty(spot). Do you have a facility to add Nifty Spot in Market watch, so that we can have the chart in the terminal?? Can someone please let me know if it is possible to place an order that gets executed based on the execution of another order? For example i place an order to buy xyz shares at price p1. I want to place a buy order at price p2 and sell order at price p3. Both of them should be open only when the first order at price p1 is executed while only one of the orders at price p2 or p3 should get executed. In a nut shell i want to exit with a pre-specified profit or loss. Thanks in advance and anxiously awaiting a reply. Such an order is called as a bracket order, unfortunately exchanges presently consider it is algo’s and don’t approve this for retail clients. You can manually place a profit order and stop loss, but will have to cancel once the other is executed manually. But what you are asking is presently not possible. Thanks for the reply. But I just searched the net and found that bracket orders are being allowed by sharekhan. I will ask my friends about it and get back to you. Lakshmi, Sharekhan is presently allowing it only for equity segment and not for futures and options. For equity segment we have also gone to exchange for approval of this product. I wants to buy / sell 20 different shares at open price or nearer to open price, on intraday basis with leverage. can i place this orders before market opening or any alternative solution? You can use Basket order for this, check this Blog. You can save a basket of the 20 different orders on an excel sheet and load it either as an after market order the previous evening or you can place it during the day. Very good information. Thanks to Zerodha for sharing the knowledge. I want to buy Vivimed laboratories which is hitting its upper circuit from past 10 sessions…. today it is closed at 164.50…5% up from its previous session…. how I have to place an order to buy it..??? Post-market order or Pre-market order…??? And at what rate i have to place the order…164.50 or more..??? now the stock is locked at 5% upper circuit and when it starts hitting lower circuit it will be locked at 5% or the lock is totally removed…. And Are these type of shares safe…???? Is it safe to trade these kind of stocks? Absolutely not, the same way it can hit upper circuit continously, it can also hit lower circuits continously.. I had placed a market order in DLF in pre-market session today, but after the market opened, it got converted into a limit order at the opening price instead of getting executed. Can you explain this? Waman , you can check page 14 on this link, if market orders are not matched, it can get converted to limit order. 1.If I Buy Stock today on delivery bases and price of that Stock goes up in today’s trading session, So I decide to Sell them tomorrow using BSTS. My question is Can I Sell this Stocks in tomorrow’s Pre-Open Session? 2.for example, I Buy Stocks of XYZ company on delivery basis. and after some time that company Delist or Suspended from that particular exchange. so Can I Sell that stocks? 1. Yes you can sell it in BTST in pre-open. But do read the risks of trading in BTST on this blog. 2. If a company delist from the exchange you will not be able to buy/sell on the exchange. If you have got stocks, you need to tender it back to the company or find a buyer for it out of the exchange. Is it possible to have more than one order window displayed at the same time,say NF and option/two cash scrips so that sudden ups and downs can be capitalized in two or more scrips to enter /exit.at the same time. Now I am keeping one order window open, put the order at market and click submit when I want and then click another scrip,click F1/F2,put order at market and execute by which time rate has already gone up down by a few points,it can be even10/20 points say in bank nifty. SL/limit order -I can place before hand for any number of scrips but for market orders…. Presently not possible to open two order windows at a time. Can i place a AMO through web site? Please let me know when i tried to do the same, it is giving me a rejected status in orderbook..If i can not place an order through web access, please let me know how to download the software and better put a facility in web also,bcz i can not access the terminal in my office……….. Yes this can be placed. What time were you trying to place this? Hi, I have tried on after 11:00 PM. But i got a message saying that adapter is down. Are you still facing the same issue? If so can you send an email to [email protected], we will have this double checked. Just placed 2 AMO’s ( on 07/Jan/2017) – around 8PM – ish, both got “Adapter down” as reason. Is this normal? Today there was mock trading on exchanges, so we were running some processes. You can probably place now. can i place the cover order as a pending order? ie: i wants to buy LIC shares at a rate of 140 and suppose the current market price is 150, can i place this order as a market order? ie: i wants to buy LIC shares at a rate of 140 and suppose the current market price is 150, can i place this order as a pending order? There is an entire blog on Cover orders, do check there. Cover orders have to be placed market with stoploss markets. Babula, I think we’ve answered your query by phone. This information is for all other users: We cannot place regular orders before the market opens. Before the market opens or after the market closes, you can only place AMO. Regular orders can be placed only when the markets are open. I hope this clarifies. i am a beginner and have one doubt. if i buy 100 shares of XYZ @Rs.100 and want to restrict my losses to Rs.3 per share, i put a SL-M order on the sell order entry,at a trigger price of Rs.97, correct ? 2. You can place your sell order either from admin positions or use a fresh selling order, it doesn’t matter. Hi, its an continuation to ASH question , if SL-M triggers at 97 and again that stock crosses 105, that time it will considered as SHORT ? or other order will be cancelled automatically if SL-M/TGT hits ? If SL-M triggers at 97, and if stock bounces to 105 it will be considered as a fresh short. You will have to cancel manually the other order if SL-M or TGT hits. Can you please let me know why his is happening… When is the window open for AMO on Monday morning trade…. As the error suggests, you have to place your order in multiples of the tick size. Could you please elaborate on which commodity you’re trying to place the order for? Generally, the tick size on NSE is 5 paise and for most commodities it is 5 paise. For some commodities, the tick size is 1 rupee. AM orders for EQ are open from 5 PM till 8 AM the next morning. AM orders for Commodity are open 24 hours, but are sent at 10:00 AM every morning! How to place pre-market orders? Check out this link to know everything about Pre-Open Orders. But do you (Zerodha) provide the facility to trade in pre open session And post market session ?? if yes, with which product type (CNC OR MIS) ?? Do you (Zerodha) provide the facility to trade in pre open session And post market session ?? if yes, with which product type (CNC OR MIS) ?? And warm diwali wishes to zerodha team.. Haappyy Diwalli..
You can place orders in pre-open either as CNC or MIS, no restrictions on that. I feel that the Zerodha platform could be more error prone for people who use After Market Orders. Let me illustrate my point with an example – On 18th November I purchased 6300 Calls on both ICICI and Zerodha. On the 18th Nov night I decided that a target price of 39 was reasonable (it had closed around 34). On ICICI, I went into my current open positions hit the square off link, specified the limit price of 39 and the order was queued for next day. On Zerodha for the same transaction, I have to go and place a Sell AMO for 6300 Call. However this is error prone especially for people who trade in Out of the money options. For eg. Lets say my intention is to square off my existing 6300 Call for 39. However in the AMO sell option in error I choose the strike price of 6200 instead of 6300. If this gets executed the result would be that instead of squaring off my existing position I have written/sold a naked call of 6200 (assuming I have the requisite margin in my account) for 39 or above. I would suggest that for existing open positions, 2 links be provided – (a) Market Square off (which can be disable during off market hours) (b) After Market Hours – If one clicks this then it provides options for either a limit, stop loss or market square off and the order gets stored as an AMO. This will minimize chances of error. It makes sense and will speak to our technology team and see how it can be incorporated. Hello Nithin, Thanks for this informative blog. My question is does my AMO-Stop Loss Order get triggered by the huge fluctuations that usually occurs in the pre market session? I believe there is no trade executed in the pre marketing session but only order matching so the opening price of the day is determined exactly when its 9:15AM so the stop loss orders should not be executed in the pre market session – Please confirm this understanding. All AMO orders get entered into the exchange at 9.15am and hence all the weird ticks in pre-market won’t affect any of your triggers. Thanks for the reply, can you please confirm my understanding that there is no trade that takes place in the pre market session whatsoever, both in equities & f&o, its only the order entry and matching that takes place. Can we place AMO for intraday?? 1) What are the reasons that result in violent activity in the pre market session? is it some kind of a trick played by someone for some reason? 2) Is there any particular reason why the pre market session randomly closes between 7th & 8th minute? What is the reason for this random closure? Pre-market orders are designed in such a way, check this link from NSE. I’ve a small doubt. Do Zerodha charge anything extra on AMO? Why there is no feature to square-off the positions from the trading account ? Why should a trader / investor always calculate the position using Excel sheet ? Sorry, we don’t understand your question. We do have a square off button for squaring off positions and equity holdings from the trading terminal. Everything is calculated automatically in the terminal and there’s no manual calculation required at Zerodha. Great to see your responses on Z-Connect. I use both Market Watch and Trade Express platforms to trade. I’m talking about Sqaure-off facility for “Option” contracts. I was not even provided any support from the the executives to understand about the trading platform, no manuals provided. It’s irritating using your trading software with limited facilities. The PMO link is broken. How do we place such orders? I tried to place an order at 9.01 AM and the system accepted it. The link seems to be working fine for us. Why don’t you click here to view the entire PPT on pre-open orders using call auction? Do get in touch with us if you need any other information. Need clarification regarding post market session…. In the post market session orders very few people participate, you can place a limit order and hope that someone takes it. How can I get password…. The Same userID password works across all platforms. Read this blog on how to download the mobile app. 1. If I’d place an AMO order with product type MIS in equity seg, will it automatically gets square off at 3:20 PM if I won’t square it before that. 2. Today(Saturday), I tried to place a basket order(using web TradeExpress) for 2 equities with LIMITs and MIS as the product type. After clicking on the place button I got some msg like ‘Do you want to send this basket order to exchange?’ ,I clicked on OK. But I couldn’t find any traces of those orders neither in Order Book or Trade book. I even checked if it has blocked any margin but it didn’t. I thought the orders will be rejected as the prod type was MIS or atleast I should get an error for it( as somewhere in the blog its mentioned that value for each order in the basket should be more than Rs 1 lakh, and I had only 28k on my accnt). please can you see what is the problem..my id is DK0646. 1. Yes, all MIS positions and orders get squared off and cancelled respectively by 3.20pm. 2. Krish, can you try this again on Monday, today we are running server maintenance and could be the reason for the rejection. Thanks for excellent blog. Last couple of days at market closure price exhibited on our trading system is not what is shown later in the day as closing price on stock exchange. Sometimes difference is 50 or 60 points in bank nifty. Would you kindly explain the reason and how can it be avoided in our sell or purchase at closure. My query is not related to post, but would request an answer. I am using Z5 for trading. Where can I see my portfolio? ( My investment and current value of holding). I need this badly in order to understand where I am with regards to my investment. To view your Profit/Loss you’ll have to access your Backoffice and view the Account Analysis report under NSE EQ. 1. I need to take calculator to know my total stocks value as it shows BSE and NSE separately and no total. 2. What exactly these BSE/NSE values. The stocks are in demat and most of them can be traded on both NSE/BSE. So does it show cumulative values? Why can’t you just show the purchase value and current BSE/NSE values along with each stock and profit/loss. That would be much convenient. Please have a look at MoneyControl.com or Sharekhan portfolio for example. 1. The application shows the value of ALL the stocks on BSE & NSE separately.For eg. if you hold 10 shares of Reliance Industries and if its trading at 798 on NSE and 802 on BSE, then the NSE valuation would show 7980 and the BSE valuation would show 8020. Similarly it would show the value of all stocks for each of the Exchanges provided such stocks are trading on the Exchange. 2. We’re revamping our BO and these features are included in it..We’ll be rolling out the beta of the new Backoffice very soon..
Is there any minimum order amount for placing AMO in equities? Check out this page for more details on our policies and procedures. These are subject to change depending on market conditions. AMO (After-Market Orders) will be allowed only if the value of each order is above Rs. 25,000. AMO will be cancelled if the price entered is more than 10% away from the LTP in either direction. Yes Anwar, Rs 25,000 worth of equity atleast in AMO. Well..thank you. But what is the reason behind this lower limit on AMO? With my previous broker (sbicap securities) there was no restriction on order amount. I am a person with no access to trading terminal during trading hours. Small AMO orders in sequence over some days was my way of making a position in a stock. It helps to average out stock price for medium term investments. Can you consider revising the limit downwards, at least to Rs 10,000? Is the Basket After Market Order banned from today(14th FEB 2014)? I can’t find it in the menu. Also, I can’t place an AMO between 9:10 to 9:14, also from today. If I split a order for the same symbol into multiple pieces, would it count as as single order. Say, I place an order for a stock as three different orders (10K,10K,10K) would it be constituted as a single order. If Basket AMO is banned, then there is no question of the above scenario though? Yes Basket After market order has been removed as of today. It was being misused, and causing us a lot of issues at market open. If you place 3 orders, they will be considered as 3 different orders. After I place a AMO order where do I see the order to modify and cancel it….. Sorry for the time taken to reply, you can see the AMO order in order book under open orders. You can modify it from here. ….think you missed my second question. Is it possible to reduce the minimum order limit for AMO in equities? And is there any particular reason for this limit, means if it can be shared? There is no minimum order limit for AMO anymore, we have this limit for only those people who place hundreds of orders for 1 share each. All data feeds that are given by the exchange is shared on the trading platform. So yes if there are trades happening in the premarket, you can see the volume on the platform. I am a swing trader. Say I’ve 10 positions open. To punch stop price for all 10 trades every morning at 9:15am is difficult. So can I use AMO to punch stop order the previous day itself? Hi Nithin : I’m not able to put pre-market orders. Order is being rejected and the message i’m getting is ” Trading system is not available” ! why is this happening? Ravi, pre-market orders can be placed only between 9:00 and 9:07 AM. If you’re placing them before 9:00 AM, you’ll get this message. If you would like to place orders before the market opens, use our After Market Order (AMO) facility. @ Hanan : Nope, I’m placing order in between 9:00 to 9:07 only and the order has been rejected, but the same order is exeucted when i placed afer 9:15 !! Are you placing this order on equities? Why don’t you share your client ID or send us an email on [email protected] so we’ll look into this. This doesn’t happen to any other account, by the way. Ah-ha! Got it, Ravi. 🙂 The thing is you’ve been placing a Cover Order in the pre-open session. You can place only CNC or MIS orders on the pre-open session. The logic behind this is that CO and BO are grouped orders, which means that one order has to be executed for the other order to be sent out. This won’t be possible in pre-market or AMO settings, so you’ll have to use MIS or CNC. Could you clarify the following question of mine. I read above that one can not modify AMO order between 8:45 to 9:15. But, can new order be placed between 8:45 and 9:15am? Rajendra, the post above is updated, you can place AMO anytime until 9.15AM and also modify it if you wish. sir whether a limit order can be placed of the same stock again after its first execution? Yep, as many times as you want. Can AMO be modified during trading hours? And which product code to be used to place the same? AMO once market opens becomes either NRML/CNC/MIS, based on what you had chosen while placing it before market opening. So you just have to go modify this order from the order book once market opens. Sir i place my order at 9:10 am and when market opened till that time my order was not executed and I got refrained from a profit of Rs 3/- per share,after the increment of share value my order was executed and i got only less profit. Sir what should i do so that my order gets immediately executed when market opens and i get maximum profit. Tanuj, your orders will get executed only at 9.15am only once the market opens, you can’t really execute your orders before market opens. When market opens and if you have placed an AMO order, there is a big queue and it is very tough to say what will be the price you get in the first 1 minute, this is something which is not in anyone’s control. 1) Is it possible to place an MIS order as an AMO?…i,e. order that I want to trade intraday. 2) Will I get the normal Margin exposure given for MIS orders? 3) Is Bracket order and trailing S/L facility available for MIS order as an AMO? 3. BO is a separate order type, similar to MIS/NRML/CNC. 2) If Bracket order is an order type like MIS and CNC,… can BO orders be placed as an AMO and also get the exposure limits of BO? 2. For now BO can’t be placed, but it should be possible in the next few months. e.g. if I have Rs.10,000 in my trading account, and want to buy SBI (9X exposure) using MIS code (strictly intraday) … during pre-open (9.00 am to 9.08 am)…then can I buy for 85,000 (5000 less than 9X to accommodate brokerage, taxes and loss if any) in pre-market section? Yes you can place using MIS in pre-market and After market. I am about to open an account with Zerodha…. But was a little confused about AMO & pre-market orders on Zerodha. The executive was also not sure about these details…and actually gave a total opposite picture of what u have replied. I have been trading for the past 2 yrs mainly using AMO with Bajaj Capital-Justtrade. Before changing to Zerodha, just wanted to make sure that Zerodha suits my method of trading. That’s why, I have been bothering u with all these questions. Just so I understand your previous response of Feb 18th correctly, I can place AMO for amounts less than 25000 (e.g., 10 shares of NIFTYBEES @ 750 = 7500 ) correct ? Your policy document here: http://zerodha.com/policies-and-procedures doesn’t seem to reflect the change. Arun, as long as you are using it for genuine purposes there is no Rs limit, you can buy/sell for as much as you want using AMO. Some of our clients were misusing this by placing hundreds of orders at prices way above or below the market price and hence that condition remains on the Policy document. and if i placed AMO market order in priority means it will trade in open price? or it jump open price? It is sent as soon as the market opens, but there is no guarantee at what price it will get through. can the AMO order be place for barcket order. 1) a Bracket order using the extra leverage ? 2) a Cover order at market price using the extra leverage? 3) a Cover order with limit price using the extra leverage? 4) after entering in pre-market, when the market opens, can the square off exit order be placed with out any extra margin requirement? You can’t presently place bracket or cover order in premarket. 1. As per the above discussion, cover order was not possible during pre market session in 2014. Can we place cover order during pre market session in this year 2016? 2. Are your team working on the same for providing the above facility. 3. Please include a digital watch in kite website so that we can place/cancel order correctly. 2. In pre-market cover isn’t possible for technical reasons. 3. Yep, will come soon. Sir, May I know about the rejection of Buy order..? Rejection can be either because you are using the wrong product type, placing orders much higher or lower below the current market price or if there is no sufficient funds. 1. Is there any future plan to enable BO orders in website terminal(Z5). 2. Is there any possibility/future plan to enable BO for After-market orders ? 1. It might take a while. 2. hmm.. this is a little tricky actually and may not be possible in its current form. Thanks for your quick reply but not sure about the complexity/trickiness in enabling the BO order for After-market order and in the website terminal. While opening the account, I was told that these features will be soon introduced in web terminal as well. Basically the problem is, my work timing are 10am to 6pm and in my office laptop, i can’t install any personal use software so kindly tell me how can I make use of facilities provided by your company. Presently we use a vendor Reuters (earlier Omnesys) for technology, Bracket orders is designed by them for us. The way they have designed is that it requires live market rates to determine the range within which SL/target can be mentioned. (When the markets are closed, the prices compared vis a vis to when it opens in the morning could have a big gap). Introducing this on web terminal is something that we are working on. When is new platform releasing and will it have bracket order enabled for AMO? and if so, can you facilitate it to trigger when the last traded price is within a specified range? Srini, even the new platform won’t have brackets for AMO. It might take a while for this. Can you please answer following questions? 1. Can AMO be placed between 9.07 AM (after pre mkt session) to 9.15 AM (before normal mkt session) ? if yes, will these orders be sent to exchange at 9.15 AM the same day.? 2. I read that you mentioned that Basket orders do not support Bracket orders or cover orders at the moment. Do you have any plans on implementing such features in near future ? I do understand the complexities associated w/ bracket orders and users mis-using this facility and causing big overheads for you. 3. Also, as you mentioned brackets and cover orders are not available under AMOs. will this be added in coming months ? Actually i am looking to trade a basket of genuine 20-25 stocks, placed before the normal market opens, with limit price, exit price and stop loss price well defined. 2. I doubt if this can be done in the very near future. 3. It is a risk management issue to let this happen as AMO as during the opening ticks when the market is illiquid, this can go haywire. Hi Nithin, Thanks for the prompt reply. For 3rd, just a suggestion, you can add this functionality only for stocks to start with. and also provide no leverage for such trades (for ex: client has to keep 100% equity for buy trades and 150% equity for sell trades) as in principle AMO orders are not intra-day orders. Hi Nithin, Please ignore my last message. I think i wrongly assumed the issues you face in implementing Bracket orders in AMO. As you mentioned the risk management issue, in my opinion, the users of Bracket orders in AMO should bear the risk of getting their stop losses hit near the market open and they should put these triggers wide enough for illiquid securities. Sending an AMO without using a stop loss is a big risk for retail investor, and specially for the people who can not track the market during the day and generally use AMO for trading. I hope you understand the issue. You article on pre market order and post market order informative. Over time I create my own Intraday Trading Formula to reap the maximum benefit from my trading. Success rate of trading formula amaze me, I don’t hesitate that. Some time this formula FAIL in volatile market. Hope I will solve it in future. Can you suggest me another Intraday trading system? It will help me as well as many like me to earn money from stock market. I will awaited for your next amazing article on stock trading. 4 Here the share gets sold only when it reaches 171 or below? 5 How to sell the share at 173 and above? Firstly, you will not be able to place a sell order in CNC(delivery trades) unless you have shares already in the demat account. So if this is a fresh trade and for intraday, then you can do it this way. eg. closing price of Axis bank at 562 and with hope of high volatility can I able to place a BUY ORDER at 566 as sl-m and a sell order at 572..now on next day if Axis opens below 560 then what will happens to my AMO order?? please clarify. Yes it is possible, if Axis opens below 566, both your SL-M Buy and Sell order will remain pending in the system. How do I go about buying a stock that I am sure will hit upper circuit on Monday? Can I place an AMO early morning on saturday specifying it as a Market Order? Will it go first in the Q when the market opens on Monday so that I will be able to buy it before it hits the circuit? Catching the first tick in the morning is luck of the draw, there is nothing you can do that can increase the probability. AMO is as good as placing market order at 9.15am on monday. This is exactly my question sometimes back. I understand it’s luck, but since Exchange, Zerodha and everyone else in between is using technology and automated this process, there should be a method in orders getting executed. Is it purely time based? When we place an AMO at 5.30 pm evening, is it placed immediately with the exchange or Zerodha just store and send it at next morning? Please try to explain the process so that we can try to place and do something ’bout than just relying on ‘luck. It is purely time based. Exchanges in India accept orders only when the market is open and hence all AMO orders are stored and sent to the exchange at 9.15 AM. Suppose I had place AMO order 1 at 3:45 PM on 06-04-2018 (today) and AMO order 2 at 5 AM on 07-04-2018 (next day). So in this case which order will be sent to exchange first on next day at market opening 9:15 AM ? Also Both orders at Market price which AMO order have more chances to execute first? 1) If I am selling options and squaring it off the same day – intraday – can I use MIS. IF so what would be the margin amout block for selling option. 2) If I am selling an options and executing a stop loss for the same. If not trigerred today. I carry the selling position tomorrrow…will the stop loss will also get carried tomorrow. 3) I am selling an option ce at 80. will put stop loss at 90. Stop loss not triggered today. Will carry my selling positon tomorrow. I think stop loss is still at 90. Tomorrow market opens at 100. Will my stop loss get trigerred at 90 or 100? 1. Yes, 40% of the overnight margin(NRML) requirement. 2. No, all pending orders are removed from the cache by exchange everyday. So you will have to place this order again tomorrow. 3. No as explained above. Unfortunately there is nothing you can do to cover the overnight risk. The best you can do is place an AMO (after market order) for your stoploss everyday. Following above scenario – 3——I put a AMO at 90/-. So if market opens at 100. Will order be executed at 90 Or 100. So One Sell Position and then one AMO buy position. After execution all positions are neutralized. Will not be having any open positions. It depends on if you are using SL or SL-M. If you are using a SL with limit, the SL order will get triggered but if your limit is less than 100, the order will become pending. If you use SL-M, the order gets triggered and the position will be bought back the best available market price, in this case Rs 100. Yes once the AMO is executed, all positions are neutralized. How to place AMO on android plateform.. procedure please..
AM orders cannot be placed on the mobile platform as it is available only on the Desktop and Web versions. If you would like to place AMO only from your mobile and not your computer, then you must use Z5 to place an AMO. Admin stopped AMO…I was trying to placed order at 8 pm.. Suppose we place a AMO order . how we came to know order placed or not ? is there any alert we received to our mobiles when order is placed ? No alert as such, but if you have a mobile app, you will be able to see this pending order in your order book. i have opened trading account and commodity account separately. Because of this reason i am using using now for nse and zerodha trader for commodity. is it possible to club all the accounts into zerodha trader ? Yes definitely. Send a request to [email protected] asking to move you from now to ZT. Thank So much for replay! definitely i will send mail to our team to change to Zerodha trader. today I saw crude oil in international market falls 4 dollar so I short crude oil in AMO but it reject my order after market opens by showing margin exceeds required although i have 40000 in my account & normal margin required for crude oil is around 24000 as shown in your site. Also I put a price much less than the opening price in limit order. Now please clear me how much margin do we really required to short a trade in AMO. Again if the order exceeds the required margin it should reject it immediately during its placement but it shows pending there & got rejected after the market opens. We’ve checked your order report. The reason your order didn’t go through is because you placed an order for 100 lots of crude, not 1 lot. You need to understand that in MCX all commodities are viewed by lots, not weights. If you wish to buy 1 lot of crude, just choose 1 and this will buy you 1BBL of crude. I put only 1 lot on that day. otherwise it would immediately reject the order but it shows pending & just after opening it got rejected. today I put a buy order for natural gas at 266.5 where as it opened at 264.9 but my order rejected and it shows RMS rule: check freeze quantity for MCX commodity for entity account DN0771. I am attaching a screen shot of the error it shows. May I know what it means? My second question is how opening prices of commodities at MCX decided? is it like NSE & BSE or something different. For your second question, check this link. First of all kudos to the enthusiasm with which you are looking after all the comments here, I need to know what should be the best strategy to grab a stock which is speculated to hit upper-circuit as soon as opening. Does queuing up early using the AMO a better strategy, if yes which is better AMO or Pre-market order for this situation. If a stock is going to hit upper circuit at the opening, there is nothing you can actually do other than placing a limit order at the upper circuit price and hope that someone sells it and you get filled. AMO orders doesn’t give any added advantage, they are sent to the exchange after the market opens. Thanks for the clarification, but since as you said AMO orders are sent after the market opens it would be better to queue your order during pre-market session for better chances of getting the stock then the rest? Yeah, you could place it in pre-market. 1. Will it be moved to normal market at 9:15 or will it be automatically cancelled? 2. Will it remain a market order or will it be converted to a limit order? 2. It is moved as a limit order @final equilibrium price/opening price. AMO is available for all our clients by default. You can use Ctrl+F1 to buy and Ctrl+F2 to sell. To know the timings to place after market orders and other details, check out this blog. The market depth or snap quote window shows you only the best 5 buy and sell prices. You cannot see more than this on any kind of platform. Can i put AMO orders in between market. I just curious about day before yesterday buy order execution of Praj industries with 51 units at d price of 59.95. Cos i was placed limit buy order for Praj industries with 847 units at Rs. 59 only. How come like this ? Appreciate your kind attention. Best to send this out as an email to [email protected] with your client ID, if you have placed a buy limit order at 59, there is no way it can execute at 59.95. PRE-MARKET or POST-MARKET or AFTER-MARKET ORDERS . You can place an after market order the previous evening, but stocks like these which are hitting upper circuit first thing every morning, there is no guarantee that it it will be executed. Unless you have sellers, your buy orders won’t get executed. Thanks for take time and replying to my doubt . As you told early that all AMO orders are stored and sent to the exchange at 9.15 AM. At what time Pre-market Orders will sent to exchange. do we have and advantages buying on pre-market order. Because i seen at 9:04 only buying queue will be in thousands . that queue number will show from AMO or PMO or both . AMO’s are all sent at 9.15, so what you see at 9.04 is pre-market orders. Placing orders on Pre-market will mean being higher up the queue than AMO. 1) When I place an order during market orders, I think it gets executed in the last. I want to know that do all the orders get queued according to the time at which they are placed. I mean are the orders executed on a FIFO basis? 2) Is there a way to bypass the queue and get our orders executed before other orders. 3) I feel that small orders are executed faster than bulk orders, say if I place an order for 500 shares, it is executed faster than an order for 30000 shares. Is this true? 1. Yes, all orders are executed FIFO. But when you place market, it gets executed immediately, there is no waiting as such. 3. Yeah, when you place bigger orders, that means you need more buyers/sellers to fill your order. So definitely, bigger the order size, the longer it will take for that to be executed. I see that NIFTY price starts changing at 9AM itself on Z5. Is this not strange? Expect NIFTY to change the price from the previous CLOSE price only at 9:12AM or so (based on pre-market trade matching). Is there a way by which the order is sent to the exchange(wih exchange order number being generated) sharp at 9am. I have seen this happening with other brokers and we also see a lot of orders placed sharp at 9am. These orders are placed automatically. Can you please guide how to place this type of orders?? At 9am, after market orders can’t be placed. AMO is sent to the markets only on market opening at 9.15am. cai i buy shares using amo and then same shares sell in between market hours without amo..is that possible../? I m new user of Zerodha. I have some of the following daught. Expecting help regarding the same. 1. Suppose xyz company’s stock has closed at 200. And it opens at 210 on next day. So can I use pre market order to buy stock considering last closing prise. 2. If I already know that xyz stock.is going to increase by 3%. Then I want to buy it early with minimum prise to make more profit. But when I see at 9.15am , I m getting data of that xyz stock which is already increased by 2 or 3%. Plz tell me what method I need to use for the same. 3. Consider today is17-2-15. Can I buy xyz stock with its last closing prise of 16-2-15. What method I should use? 4. Plz tell me the process of short selling using web app Z5. I saw there are two options SL- L, and SL-M what it means. Which one is better. 5. Can I use credit/margin for short selling. 2. You can use SL-M buying order. So in the above case, you can before hand use AMO orders to place a SL-M (stoploss) buying order with trigger of 210. As soon as the 210 price reaches a market order to buy is sent. 3. You can place an order with previous closing price on 16/2, but no guarantee that it will get executed. 4. Check this post for stoploss orders. . For short selling you just have to place a selling order first (similar to how you would buy). To short sell for intraday, use the product type as MIS. These orders will be valid only for intraday. Check this. 5. Yes, you can, but only till 3.20 pm. We had been using Sharekhan since 2008. Now I had opened an account for my wife with Zerodha after seeing various posts and comments from people about discount brokerage. But disappointed with terrible performance of the platforms. Web based platforms are slow. Everytime login with login password, Image, two security questions and every trade authentication with trading password is unprecedented. Tell me where to see the actual profit made in a trade. if I buy of 100 shares of xyz at Rs 10. On the same day price moves to 15. Now unrealised profit shown is is Rs 500. Now if the share closes at Rs 15. The next day if the share is running at a price of rs 16, the unrealised profit shown is (16-15)*100=100, whereas it actually should be from my actual cost incurred. ie. (16-10)*100=600. My wife’s account is yet to get enabled for Pi. I do not know whether Pi got better features as Sharekhan’s Trade Tiger terminal. Sharekhan does not apply any cap of balance in account to give the services of TradeTiger. Vinod, NEST/ZT is a vendor based software which is used by most brokerages in India, and yes definitely not comparable to Trade tiger. That said, with Pi and Kite (our in house software), I think you will see that it will not only match to trade tiger, but it can do a lot more in terms of backtesting, coding, and large amounts of data on the chart. Sharekhan has started charging Rs 10,000 for tradetiger which gets adjusted with brokerage. Pi final release will happen in the next two weeks, and we will have another criteria to determine active clients. No Shyam, exchanges will consider that as an algo and not allowed for retail. In our new platform Pi, we have an option for you to code strategies. So it is possible to get an alert at 11.50pm, but someone has to manually still click on buy/sell. Markets are closed today, and hence you will not be able to place orders. I set up a MIS AMO trade for Buy-Limit=100, Sell-Limit=110, and SL-L=95. My Sell order got completed and buy order is still open, noting that the stock passed by the Buy-limit amount. What would have probably happened. What am I supposed to do now? I guess the stock is trading around 110, so your sell order got executed. Your limit buy and SL buy is still below the current market price, so it is still pending. You have to either wait till it drops there, or else if you want to square off your shorts anytime you can modify the buy limit to the current market price. 1. Can AMO be placed on mobile platform? 2. I had a message rejecting my BTST trade as “RMS:Rule: Check holdings for entity account-DH0*** across exchange across segment across product”. Can you explain it? Yes Harsh AMO can be placed. Best you send individual queries to [email protected] with your client ID. Sir, first I want to thank you for your investor education programs. Secondly I want to know whether AMO can be used for intraday trading or are they only for delivery. They can be used for intraday trading also, so you can place an AMO with product type as MIS. shell i buy a order using AMO in NRMLwhen i buy in NRML i getting error message rejected equity order are not allowed in NRML. Santosh, for equity you need to use product type as either MIS(for intraday) or CNC (for delivery. NRML is for trading F&O. Can we use margin to place order (intraday) in pre open market session? Yes you can place MIS (margin intraday) order, but not cover and bracket orders. Yes, you can place MIS orders in preopen. Although, we do not allow BO and CO orders to be placed in preopen. All after market orders are sent to the exchange only at 9.15 am. sir i sell bliss gvs pharma at 157 ,then share goes to 158 to upper ckt limit.then there is 0 ask quantity.then it can be square off ?i sell in intraday.how to square off in this condition?if do not happen till 3.30 then it can be square off in b/w 3.40 to 4pm.or it will be converted in delivery ,without my consent.or ur software will automatically suare off after 3.20 pm,as i sell in intraday. HOW TO MINIMIZE LOSS. Sandeep, that is the risk of shorting illiquid stocks. If it stays at circuit the whole day, it will forcibly get converted into a delivery trade. You will be required to give delivery in two days, failing which it will be treated as short delivery and you will have to pay auction charges. Check this post. Is it possible to ensure that your order placed in AMO reached NSE first compared to all other orders placed by all brokers. I am asking this because when I place order in sharekhan, it reached NSE first while in Zerodha it gets placed later. So, if I want to trade a stock with low liquidity, then there are chances that my order will not get traded in Zerodha but will get traded in sharekhan. Please clarify on the time stamping process of NSE. Aman, it is basically luck of draw. Everyone will send orders at same time when market opens. Usually the first 15 to 30 seconds, getting ahead of queue is not really in the brokers hands. What will happen to the following consequence…….. If i bought 100 shares with MIS in 5x the value of the share…..I have only RS.20,000 in My demat account……..But i have bought the shares with value of RS.50,000…IF the share hits lower circuit ……..I am unable to sell my share………..What will happen next……..
We will be forced to take delivery, and we will ask you to transfer more money asap. If money is not transferred, it will get sold whenever the stock is next out of lower circuit. Can u send an email to [email protected] with your client ID. All orders are sent at the market opening, so unless the stock is really illiquid it should get executed at 9.15. First of all, thanks a lot for resolving each and everyone’s query. Can after market, pre market and post market orders be placed using Zerodha mobile app? If yes, then please mention the procedure for the same. You can most definitely place pre and post market orders on the mobile, but after market orders are not enabled by design. When the mobile app was created, it was meant to be used on the go to place any orders if you’re not in front of your computer. For stuff like AMO, the developers presumed that you would use your computer. Although, now most of the people trade only using mobile or tablets – so we’ll have this fixed in the Kite mobile app. When zerodha is planning to launch Kite app? Is it going to be android only app or will be available on apple store as well? By when do you think you could start bracket orders on NEST or Pi for MCX segment? Is there any way we could help, like maybe petition MCX for this? MCX is not giving approval for brackets, so tough to say. Don’t think a petition will work. Suppose I execute a CO buy order and a sell limit order at higher price. Will this square off the CO buy? Hey Zerodha. I am ready to open an account. But I do have a small query. If I want to buy a 1000. Shares of a XYZ company at price 5. But the company is trading at 5.50. As I will not be able to watch the market continues as a job holder. 1. Can I buy 1000 shares of XYZ at 5 by placing which order? As whenever the stock comes to 5 my order should be executable. 2.And if I want to sell same 1000 shares at 6, then which type of order I can execute. 1. Place a limit buying order at Rs 5. 2. Place a limit selling order at Rs 6. But note that these orders have to be placed daily as any pending order at the exchange end of day is removed from the cache. AMO is very useful for traders who are not active during market hours or who are engaged in other activities apart from trading. Here order gets executed (either buy or sell), but how to place our stop loss and target for the same order when we are not before our trading terminal? In this case, how to sort out, either CALL AND TRADE and mention the target and stop loss to Zerodha staff or you have anything that can be done along with after-market orders for stop loss and targets. Thanks in advance. You can place all the three orders at the same time if you have enough margin in the account, entry order, target and SL order. But if your order gets executed in the morning, you can definitely call our call n trade numbers to place SL and target. You can also use our mobile app or our new web app kite.zerodha.com on your mobile browser . Hi, If I want to buy exactly at the Open price, which type of order should i place? You have to place a market order when market opens. But there is still no guarantee that it will get executed at open price as your order hits the exchange in a queue. No Mangesh, doesn’t work like that. All brokers send there orders at one time at 9.15 every morning to exchange. So the queue at the exchange is a like a lottery. Can u please help me and give a solution ? No solution as such Mangesh. When orders hit the exchange, they all automatically queue up. High frequency trading systems has better odds of landing up ahead of the queue. All AMO orders are fired to the market after the market opens. So if it opens at 3080, your order becomes a pending limit order at 3050. If it opens gap down at 3040, your buying order will be like market order(since you have placed a buy at higher price) and will get executed at whatever price below 3050 market opens at. If I Buy Stock in after market Order and sell next day will it still be BTST. I am a new investor. first time in the market and this Zconnect helps me clear my doubts on the Pi and everything else. It’s Just like google to me. But I am all alone out in the ocean and trying to swim. how do we get some advise on what to buy or sell. What stock need to be bought and when it needs to be bought. If you don’t provide this service what do you recommend to all the young guys. Please let me know how first timer can go ahead with Zerodha. Can we place limit order in MIS for Nifty futures during pre-open session? Would like to tell you that objective is to buy/sell Nifty futures at the opening price. Pre-open is only for equity trading. But you can use the AMO orders to place limit MIS orders on Nifty fut. You need to know though that all such orders are sent to the exchange only after market opening. So it is as good as you placing an order at 9.15am. Getting the opening price is like hitting a lottery, very tough as lakhs of orders hit the exchange at the same time. 1) Can I placed the order before 9 am for FNO segment? 2) Can I placed the order in between 9 to 9.8 am for FNO segment? If I put the order for Future stock before 9 am then the order is rejected and reason is “The markets have not been opened for trading”. I put the order at 8:04 am. When the order should place before market start? If you want to put before 9am, use the after market order feature. If you place a normal order, it gets rejected, which can be placed only after 9.15am. After-market call (in commodity) never got executed. Not sure if I am doing anything wrong. I hope we can place AMO as MIS if placing it same day (e.g: I am placing the 5 lots shorts in crude at 9:45 AM today for today’s market). 2. If suppose the order didn’t triggered at market open then will it get executed later on (after opening of market) when that value comes? 1. When the market opens many orders hit the exchanges at same time, so your order will be typically in a queue. There is no way to say which will get executed faster. 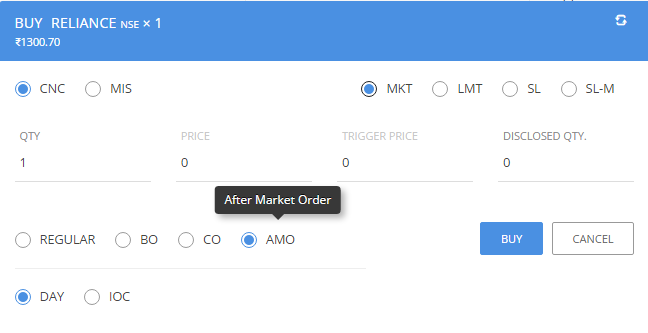 Yes you can place AMO as market orders. But like I said, no guarantee at what price it will execute. 2. If it is a limit order, yes it will remain pending and get executed whenever that price arrives. is it possible to put buy and sell order in AMO order with limit price. I have limited access to internet. So I want to put both orders in the same AMO. Please let me know. You can’t place both buy and sell in one order. But yes, you can place AMO limit orders, both for buy and sell, but separately. I alrdy place AMO. But i wish to cancel my order. is it possible to cancel my order before trade starts? Yes, go to order book and cancel it. i tried lot to cancel AMO Order on kite,but unable to do so..today a zerodha representative called me to tell, that i can’t cancel AMO order on kite and mobile platform. strange and funny that i can place AMO Order on kite but not cancel it. Of course you can cancel AMO orders on Kite. Having this checked, why it didn’t let you do it. My pre-market/after-market are never getting executed in Zerodha? Can you please let me know what should be done to get the matter resolved? A broker only facilitates placing orders. Order matching & execution happens at the Exchange based on price-time priority. There’s nothing that can be done specifically for an order to get executed. If your order ranks up on the price-time priority the Exchange matching engines will match & execute these orders for you. Yeah I understand that but my concern is my pre-market order never got executed, Ironically my friend placed the pre-market with Angel at same time with same limit and it gets executed almost every time. Not sure what is the exact reason of this. Possible for to investigate the issue as I am really concerned about it?? Any update on same please?? Today also same this has happened with me, I placed the SELL order (after-market order at 9:52 AM) in crude at 2963 and even though market opened at 2975 it didn’t got executed. It’s really disappointing to know that the similar order placed at same price and at same time with another broker getting executed. I am ready to help in every sense I can but I want this issue to be sorted. Let me know if it cannot be. Getting someone to call you back. Did you place a stoploss selling order at 2963? That is the only reason I think, it wouldn’t have executed. Getting someone to call u back. No it was a limit order of MIS type. Have received a call from zerodha, hoping to get this issue resolved very soon. I want to have a better clarity on AMO orders and the difference between AMO & Bracket Order. Kindly confirm my understanding on AMO orders is correct based on the below example. Nifty has closed 7655.05 on 04th Sep 2015. I am Placing an AMO Order with a Target buy price of say 7670, SL-M (sell) as 7640 and Target Sell Price as 7710 on Nifty Future expecting that it would be bullish on 07th Sep 2015. But from the pre market period itself it is bullish and @ 9.15 the market opened at 7650 and going in the downward trend. 1. Whether my AMO order would be executed or not ? 2. Whether It would buy @ 7650 and triggers SL-M @ 7640 even though my original buy call was 7670 ? 3. Whether two margins is required in AMO – MIS orders one for Buy and one for SL-M ? I found AMO & Bracket Order are one the same and the only difference which I foresee is that in Bracket Order SL & Trailing loss is enabled where as in AMO, SL & SL-M is enabled. Am I right or there is any other difference ? 1. Yes your buy order will become like a market order, if you place a limit order with a price higher than market, it becomes a market order. 4. Instead of keeping a limit buy at 7670, you can place a SL-m buying order with trigger at 7670. So unless market opens above 7670, it won’t be bought. AMO and bracket orders are not related at all. AMO or after market order is a way to place orders once the market is closed for next day. Thanks for your immediate response. I have clarification on your third and fourth response. 1. Whether for MIS orders two margin is required. I heard that only for NRML orders you need two margins that is one for Initial transaction and another one for SL-M. Pls. confirm ? 2. As quoted by you if I choose the SL-M (BUY) as 7670 then after order execution only I can place my Target value and SL-M (SELL) during the Market Hours. Actually I do have a challenge to be online during the entire trading hours. So I prefer to place an order before the market opens and gets executed as per my target value or SL. Else let it get square off @ 15:20 hrs. automatically. My requirement here is for example the NIFTY LTP is 7650. I should buy the NIFTY if it attains 7670 and I have to set a stop loss @ 7640 & Target as 7710. Pls. let me know what is the best mode of order to fulfill my requirement without being online during Market Hours. 1. Yes even for MIS, margin will be required extra if you are placing two separate orders. If you are exiting a position, margin is not required for 1 exit order. What you are asking for is not really possible. You have to wait till ur entry is executed, and then u can place other two orders. Yes you can, use the product type as MIS while shorting. i have query regarding After Market Orders. suppose if reliance communication closing price on 18.09.2015 is 66.40 on nse , before market open on Monday ie. 21.09.2015 i heard some positive news about the company , and i place after market order on reliance communication at 21.09.2015 at 7.30Am, at what price my after market order executed whether @66.40 on 21.09.2015 and some other price , please confirm? When market opens, if rcom opens above 66.4, your order will remain pending. If it opens at 66.4 or below, it will get executed. Can I place orders during 5-7 am. through Zerodha. i.e. When is the daily server downtime? We might be running our beginning of day process at that time. IF it is, you will not be able to login. If you are able to login, u can place orders. Hi. I m srinivasan lakshmanan. I m using zerodha since 5 months. I want to place a AMO after market close that is exactly 3.31 pm to 3.40 pm. When I place AMO order it is saying rejected by admin. Can u explain me. As u mentioned AMO is possible by After 6.30pm only. Then how can I place order during those period of time 3.31 pm to 3.40pm. Srinivasan, you can place AMO only after the trade process for the day is complete. So this is possible only after 6.30pm. Yesterday I placed two stocks in AMO. Every day I m trying, these orders become pending and cancelled end of market close. There s no sellers particularly for these stocks. How can get executed these stocks. I thought, if I place in AMO I can get these. Thats why I messaged you. How can I place PMO. Can I place order normally as I place order during live market. Please clarify. If there are no sellers, there is no way to buy these stocks. You just have to place a limit order and hope that it hits. zerodha customer care service is very busy. this no.8040402020 is always busy.plz dont ignor. Today (sunday holiday) around 1400 hrs I placed After Market Hours order to buy Nifty Oct 2015, 3 lots. The order books says ‘rejected due to adapter down’. At the start of this blog it is mentioned that AMO can be placed between 6:30 PM to 9.15 AM, which I have failed to note. Whether there is any change in the timings now? Further it is mentioned in the top of the blog that “Please note that if you place any after-market order between 9:15 AM and 6:30 PM, they could all be cancelled by 6:30 PM”. A little confusion here. Whether I will be able to cancel any AMO order immediately after placing it? Uma, if on a particular sunday we are running maintenance process, you will not be able to place orders. Best to try around Sunday evening. I am holding 2 lots of call ( Tata steel ) and I tried to place an after market order. I got a green msg that order placed but I can’t find that in any of the window like notification / pending order or executed order. How I get the confirmation that my order is properly posted. I tried this from web browser just couple of hours back on Satday. Abheek, click on orderbook, you will be able to see the status of all orders. Check this https://kite.trade/docs/kite/. Also yesterday was mock trading day on the exchanges, so if you had placed any AMO during the mock time, it would be cancelled. Not possible online currently. Check this answer. i want to trade nifty index in pre open i.e 9.00 to 9.07 with buy or sell…..is it possible in zerodha if yes how? Code is DU0347. I frequently come across this problem. During the morning hours Kite or Pie shows holding position as nil and account value as zero even though I hold positions. Today just now I logged into Kite and the value is shown as zero and position hold as nil. But I am holding long in Nifty Nov futures 675 numbers. Hence, there is hurdle in placing after market hour orders. Suppose if I place any order it gets rejected. Kindly rectify this. Thank you, Today at around 7 AM Kite dash board shows Total account value 0, Free cash -5,51,945.29 and Margin used 5,51,168.04 but this appears to be wrong also, All the positions are closed yesterday itself and free cash should be positive and there appears to be some error in the number shown. It appears any error gets rectified before market opening but there would be problem in placing AMO. We run some beginning of day processes which is why you may not be seeing right values. Check Q to get an update of your funds & positions. When you are placing an AMO it doesn’t validate whether you have sufficient funds/securities. It only gets validated when the order is sent to the Exchange. Sir in pre-market session is there any extra brokerage charges for placing order as MIS product type ? Zerodha please add, global indices to the market watch list.. This would be of great help. Will let our developers know. I spoke to Zerodha customer care and also read the complete blog above regarding AMO. I am getting contradictory information from the article above and what was told to me by customer care; hence the question here. I was told by customer care that if I place AMO, the order would be executed exactly at Open price at 9:15:00 without any delay. However this is probably not true based on what is written above and the order would be queued up for execution in the next few seconds. There is a contradiction here. I guess what is mentioned above is correct (it would be queued up and it would take a few seconds to get executed as Market order for AMO orders). 1. Which of the above two options have greater probability to execute closer to 9:15:00 am? 2. For AMO Market Orders, how much time in seconds (a rough range) does it typically take to get executed after 9:15:00 am? This is for Nifty Futures of near month, which are always very liquid. 1. Place a market order at the open (not using AMO), greater probability of faster execution. 2. AMO orders time is not fixed should happen fast. But worst case, it can take upto a minute or more. So if you are worried for the fastest execution, place a market at open. Will try to figure out whom u spoke to on our team. Great! This answers my queries. In fact, I just received a detailed response on the same lines from your team as well. For Equity Delivery is After Market Order is available on non working days for example on weekends ? Yes it is, unless there is server maintenance. If i buy a stock on 3:15 PM today (delivery) , is it possible to place an after hours order at 7:30 PM to sell the stock ? I am following a stock and which is upper circuit from past two days. I am placing AMO at market price but still not able to buy that stock. What is the best way to buy these kind of stocks. Is it possible to place an order say on friday then can it be get executed on saturday? There is no trading on Saturday, today there was mock trading. Basically demo trading for brokerages to be able to test their platform. — I want to know that if limit buy price is not matching with current market price but market price is lower than my Limit Buy Price is it will not be executed at exchange rate (Which may slightly differ but is lower than my limit price)? Yes if you place a limit buy order with a price higher than current market price, it will turn into a market order itself. Its 1:50 AM right now and I have rebooted my system, logged-out and logged-in of NOW Software and still not being able to place an AMO. This is the error. There might be end of day process running. Hi , how to but equities / features at z nest platform in POST CLOSE- 20 minutes 9 between 03.40 to 4.00 O clock , simply by pressing F1 ?or Shift F1 ? iS THE MARKET OPEN TODAY – SAT??? My kite console is allowing me to trade. I sold one share of HDFC bank just to check and the transaction went through….. Even my AMO got executed. How is this possible? Or is it mock trading or something? AMO delivery orders are also zero rupees. Only intraday orders are charged. When can i expect a T+5 Margin product in KITE???? Would you pleased to clarify the problem the retail/small trader faced in pi trading platform. 1. what is the criteria for using bracket order? bracket order are not activated in pi, I tried it. Why should I place round figure in bracket order (fraction like 100.45, 100.65 could not be placed but 100, 101 could be placed)? 2. Why limit order can not be placed in cover order within predefined risk band. why there is only market order in cover order system. why there is no target orientation in cover order? 3. how to calculate leverage limit for individual stock? 1. Why would you use a Bracket order: Get the power of much higher leverage, with increased protection, and also ensuring that no profitable position turns into a loss. Bracket order is already enabled on Pi. Here’s the link to the blog which explains how to place a BO: http://zerodha.com/z-connect/tradezerodha/zerodha-trader-software-version/bracket-orders-trailing-stoploss-sl You can place a BO at any rate. there are some key term in after market order section like disclosed qty,validity(day,ioc) and type(day,amo)..Please mention how the key term are works? IOC order is Immediate or cancel. So if your order is not filled, it gets cancelled immediately. Day order is the order will be valid till end of day. AMO orders are after market orders, using which you can place orders for next day. if i need to put the trigger for some bigger margin may be it will be tomorrow or next week . Best to use IOC orders. http://zerodha.com/z-connect/tradezerodha/zerodha-trader-software-version/orders-place-modify-cancel-view has answers to all your queries. I can’t access system between 8.30 – 4.30pm. I want to enter in trade in premarket section. For this case which order need to give.? AMO order will execute only after 9.15, right? So my query is, is there any option to place pre market order before 9 am? You can place Equity orders by placing normal limit/market orders in the pre opening session from 9.00 am to 9.07 am. can i place BO for executing nifty futures buy/sell in AMO>????? Would help if you can send us an email with your client ID and the date on which the order got traded. The time stamps printed on the contract note are derived from the Exchange trade files, so it’s unlikely that it’ll be wrong. Buy on market price with SL-M. AND SL should be rs.5 down from execution price. For ex- if buy price 100 then SL -95. If buy price 103 then SL- 98. It is possible any how by bracket order, basket order, cover order, algo, pi or Any other way. if stop loss order not allowed in pre market session then it is possible that i place an order without stop loss in pre market session and after execution of order add stop loss in continuous session i.e. after 09:15 . Is there any way to place a order for a week or so period on time. until successfully. I don’t want to place the same order daily. We are working on starting this feature Jignesh. I want to place intraday buy order which should execute in pre-opening session . Could you please let me know the way to do that and which parameter i need to select to place the order successfully (i.e Order Type : Day,CO,BO,AMO etc and any other ). Sorry, just use the normal order type MIS and place it after 9am. I wish to place AMO (After market orders) for 50 stocks to buy and place SL orders/bracket orders for another 50 stocks . Is there any easier way to do it through say some Excel sheet etc. or do we have a Software for it. Or suggest some simple way to do it. Thanks. Not possible on the trading platform, you will need some external software to do this. i am placing my order at 3211 on 9:59Am wheather the order taken or not. What is the procedure for placing the pre open market. Explained in the post above. Can I put some nifty futures AMO orders Saturday and Sunday anytime ? HI sir today crudeoil mini [email protected]…… next second it goes to 3400 ….. using amo it put buy at 3364…. the order is not taken……….. what is the reason? All AMO orders are accepted by the exchange after market opening. So it is possible that by the time your order reached the exchange, the price went up. What does stop loss means in AMO buy order? Is it means to minimised lost as in cover order or price to enter the market? Please clarify on this as I am confused. You can use the SL order to place a SL for your existing position or as an entry order to buy above a certain price or short below a certain price. hi, as i see the stock goes up by 1% or more less before we could enter in that after 9:15 . how could we enter in that. does the AMO do the trick and what price will i get the order executed if i place AMO. and if i place order at market price can i get price somewhere between the price after market opening and yesterday’s close. plz rply soon…will help me and some of my friends..
Naman, AMO or any other orders actually enter the exchange servers only after 9.15 am. So there is no way for anyone to get a price between yesterdays close and todays open. Hi Team, can i sell future stock during pre-market time 09:00-09:08. i am not able to place the sell/buy order for furture during this time. No you cannot. Only equity. Today, 9 Jul 2016 (Sat), I just logged on through PI and found that trading on some stocks like TCS, Infy, Sun Pharma etc was ON. I even managed to buy some tocks of TCS. How is this possible when there is no trading on Sat. When tried buying more, error msg “Adapter…” was displayed. I tried AMO, earlier but “Admin rejected….” error was displayed. Kindly clarify as I am confused why there is trading on Sat. Thank you. Uday, there was mock trading conducted by exchanges today. None of those prices are real, it is done to test out all the systems. We participate on every mock with the exchange, hence you see the prices changing. Send account specific queries to [email protected] You can’t apply for IPO online. You can mention the zerodha demat account details on an IPO form and apply offline. If I trade after market hour. And due to high volume next day market open at 1505. Will my order get execute @ 9:15 and if my predictions goes wrong and if lupin falls from 1490(current prize) as my limit I had put was 1505 will my order get execute. Orders at the Exchange get executed on price,time priority. If your order to buy is the highest available bid, then it’ll get executed. If there are other bidders who’ve placed an order at the same price, the order will get traded in order of time priority. There’s no guarantee that placing an order at “x” price will guarantee execution. I want to ask clear my doubt about commodity AMOs. suppose markrt closed yest @3100.
at nymex it went up. and if it seems to be jump directly at 3150 at 10:00 AM. suppose market opend @3115 and jumped to 3150.
ie. open prize-3115, cmp 3150(@10.00 am). and low is 3115 i.e open prize. 1) If i hv placed buy AMO (SL type) @ 3120, will my order get executed? at3150. will my order get executed and what prize? 3) If i hv placed AMO( Limit order)@ buy @3120.
will my order get execute and if yes at what prize?? 1. Can’t say, most likely no. 2. Can’t say. It can be anywhere between 3115 to 3150. 3. Can’t say. If you place a limit buy order higher than the current price, it as good as market buying order. Sir, I want to know how can we carry forward our orders to next day if it is not executed same day. it is very cumbersome to place same order everyday. is there any way otherwise?? Currently no way, but we are working on something for this. hello sir, Is there any way to get benefit of gap up or gap down we see in commodities..
we generally see 20-30 points gap upnor gap down. Using nymex/comex cmp we can predict what price market is gonaa open. Hmm.. Sandip, if only I could predict :). This is the formula to convert CME price to local crude price. Will it take some seconds to get executed. (Which normally happens when I place a market order at 9:15am , it gets delayed by some seconds and I have to face slippages ? I feel that there should be a digital clock at the top in KITE website to ease the customer to sell and buy at exact time. Every time we have to check current time in different website during premarket and closing market time. No guarantee. All AMO’s are fired to the exchange after market opening, so your order may or may not get executed if the 484 price is hit a fraction of second before your AMO reaches the exchange. Hi….do we have GTC (good till cancel) option in Zerodha ? No GTC as of now, clock will come up soon. Sir, why we dont have “net position” in Pi.? It helps..Its there in NEST and really helps..Can you incorporate?.. There’s a ‘Net Qty’ available in the Admin position window. You can right click on the Column header to add more columns. Sir, If i buy XYZ company’s 200 Shares on monday evening at 7:00 PM, can i sell that XYZ company’s 200 shares on tuesday morning at 9:16 AM ???? On 2nd Aug 2016, HCL tech closes at 800 and on 3rd Aug morning(around 8AM) I come to realise that it will move up so I put MKT order at 9AM but it opens at 869 and my order get executed at this price and then it goes down for the rest of the day so, can any one tell me if there is a way to get profit out of this i.e. buy at “previous close” price and sell today at any price ?????????? There is no way to buy a stock at previous closing price. Can you please provide some of your valuable suggestion for stock trading for a new guy like me ? For e.g. : In what type of stocks should I invest, initially with how much money should I enter into stock trading, some trading tactics so as to make some profit and not losing the money etc. ? how to place order after market in kite? Sir, how much leverage will i get if i have 1 lakh in my trading account for intraday trading ? Is there any extra charges if i’m using leverage or is it same like normal trading ? I”m from kerala and zerodha is having an office in cochin. So is it possible to place my orders by calling to cochin office ? Yes you can call by calling the Cochin office. You get upto twenty times leverage for intraday. I have submitted application for Demat and equity trading account at Zerodha. With my existing broker Mangal Keshav, all my AMO go to Pre-market session at 9.00AM. Some are executed and remaining go to normal session at 9.15AM. May I request Zerodha to adopt the idea. Suppose LTP of a share yesterday was Rs. 10 and I expect the price will open at Rs. 10.15 on next day. If considering this case and I place two orders simultaneously during pre market session (buy @ Rs 10.05 and sell @ Rs 10.10). Please tell me if both orders will execute or not. will I get profit or not..? Can we place a single order which can automatically be placed daily till its execution for Equity & Options. Currently no, but on our list of things to do. From what I understand the current available leverage is 11x for MIS orders and 20.8x for BO. Is 11x leverage given for MIS orders without a Stop Loss? Will I get more leverage for MIS orders if Stop Loss is provided? Yes the leverages of upto 11x is for those without stoploss. If you are adding stoploss brackets/covers, you get higher. Can i place AMO between 9:08 AM to 9:15 AM . I have seen this quite often that the open price mentioned in google finance or even in Zerodha Kite/Pi doesnt match with the open price at 9:15 AM or the open price of the first, 1 min candle. Do you have any idea why is it so? For eg, Today RCOM opened at 51.60 INR but we can clearly see that the open at 9:15 is 52.05 INR. Is it something to do with pre-open? Pi should generate Alert if price is entered beyond a certain percentage of last traded price to prevent mistakes in order price. User Settings should facilitate selection of the percentage. Similarly an alert should be generated if the order value exceeds a pre-defined value to avoid inadvertent orders. User Settings should facilitate selection of the pre-defined value. I want to place a order in F&O during 9 to 9:08, which is pre open session, is it possible. Pls update me i am looking for broker who can give this facility..
No broker can place order in F&O in pre-market. Pre-market is only for equity. Krish, online IPO is still not possible through Zerodha. Krish, not possible for now. You can use the demat details and fill up a physical form. I am new to trading and use Kite for last two weeks. I am unable to find some equities like WELSPUNIND ,PRABHAT DIARY in https://zerodha.com/margin-calculator/Equity/ (Margin calculator). Last week also I tried to execute a BUY on a different Equity but it failed , I guess reason being it was not shown in MARGIN CALCULATOR. Is there any restrictions on some Equities in Zerodha . Please forgive if it is my ignorance. Faz, intraday leverage is given only to stocks which are liquid and don’t hit circuits. IF it is not shown on that list, it would mean you will need 100% capital. Can I put a market order at Friday and expect it to be executed by Sunday? No Gaurav, orders are executed only when exchanges are open. How much leverage will I get if I use AMO?the same as bracket order? i want to use AMO as MIS ?what is the max leverage i can get? For equity upto 10 times, for F&O 40% of exchange margin requirement. But BO gives upto 20 times leverage right?why cant AMO? Bracket orders can’t be placed before market opening. You can place it once market opens. As known to all, BSE has put weekly/quarterly/yearly filters on many scrips & some good quality cos have stuck in upper limit. In such upper limit, chances are high of matching in premarket session. So, it will be very helpful if all AMO orders hit exchange at 9:00:01, and if not executed, carry forward at 9:15 market opening automatically. Many brokers are offering this. Zerodha users can’t place order sharply at 9:00:01 and miss many opportunities where other software based systems win. On October 1st, many filters are going to change. Zerodha should speedup if they are working on this already. Can you please share the brokers who are providing this facility. I am new and I want to open my 1st account in Zerodha with zero knowledge of ‘share market’. I need training… like: How to trade?.. etc, but not in documented manner. Do you have any good trainer for me? Any support? when we buy shares in cnc ,and after two days when we sell it . why it again shows in positions? suppose we buy it in 50 per share and sell it in 52 ,after selling it , if the share increases to 53 then in position it shows in loss with avg cost 52 in the same day . then actually what happenning either i had profit or loss? please answer me.or after that any process is there? It shows in positions only for that particular day. It shows there just in case you decide to buy back again, in which case it will be an intraday trade. Any P&L shown after you sell CNC in positions doesn’t effect you at all. Sir if i place AMO after 6:30 PM, Can i modify it between 9:08 am – 9:15 am the next day. Suppose on 22/09/2016 ASIANPAINT closed at 1189. On 22/09/2016 after 6:30 pm I placed order for buying ASIANPAINT at 1195, qty- 500. Now on 23/09/2016 at 9:08 am the opening price of ASIANPAINT comes at 1196, can I modify my AMO of 1195 to 1196 between 9:08 am to 9:15 am ? Thank you. Yes you can modify AMO order between 9.08 am and 9.15 am also. Hello , How can I place an order which is valid say for a month for a given price rather than getting expired in one session if that price has not reached ? I am a Zerodha Account holder , you can ask your rep to contact me if more details are required. Milind, currently we only allow good till day orders, so all orders get cancelled end of day. Hi, I have 25-30 scrips..now is it possible to uplaod a file for AMO for selling the scrips at any limit or stop loss price as against placing AMO for all scrips individually? Bharat, we don’t currently allow basket orders on PI/Kite, we are working on making it happen. How to know the closing price in post-market session in Kite. Market watch displays last traded price if no transaction is executed in the scrip in post-market session. No rate is displayed in Marketdepth if no bid exists. I think Post-market Order as market order are placed at last traded price if no transaction is executed in the scrip in post-market session and hence cancelled. IF you are looking at equity, closing price shows up as C in the market depth. For F&O only LTP will show. Yes post market order is allowed at only one price, the closing price. Yes, I am looking at Equity. I raised query because C in market depth is closing price of previous day. Today’s closing price is not available. Kindly review. Can i place the order and execution of AMO by 9am of the trading day instead of BTST in future trades. You can place AMO, but I didnt get the BTST bit. How to know the closing price of an equity in post-market session in Kite. C in market depth is closing price of previous day. Market watch and limit order window displays last traded price if no transaction is executed in the scrip in post-market session. No rate is displayed in Market depth if no bid exists. Order gets cancelled when I select order type as “market” in post-market session perhaps because it is placed at last traded price if no transaction is executed in the scrip in post-market session. Today’s closing price of an equity is not available in post-market session in kite. I am waiting for a favour. In the post closing session you can only place market orders at the ATP (Average traded price) that is declared by the Exchange which will also be the closing price. So in all likeliness, the closing price in the normal market will be equal to the closing price in the Post closing session. In post-market session “Market order” displays price as zero. It always gets cancelled. C in market depth is closing price of previous day. Market watch and limit order window in post-market session displays LTP (not ATP) of normal session. No rate is displayed in Market depth if no bid exists. Today’s ATP is not available in post-market session in kite. How to see ATP ? Where is it indicated in Kite ? Hi, i have question regarding the pre order. Can we use this to short a stock even if we dont have that stock in our account for intraday purpose? You can place an MIS (Intraday) order to short sell a stock. Today when i try to put BANKNIFTY PUT Option of more than 250 lots in a single order , it is not allowing to place the order giving error message like” only maximum 2501 shares is allowed for my ID DP1423 across all segments) because of which i’m not able to put my orders quickly and lost the best rate for the BANKNIFTY06OCT19600PE at 50……Could you please let me know when i’m not able to put more than 250 lots at a time in single order itself what is the logic behind it for restricting it to 2501 shares in BANKNIFTY OPTION. Can I place AMO sale order for any commodity in NRML ( Spouse I have one lot of Gold in buy) and I want to place AMO at 9.59 or before to sale the same when the market open. Pending CNC equity orders should get cancelled at 15.30Hrs and blocked margin should be released so that buy order could be placed in post-market session. I could not place buy order in post-market session as margin was not released. Anjali, you can only cancel BSE orders after 3.30; NSE orders get stuck dont know why. I too buy in the post closing session; what I do is use the Cancel All option in Order book at 3.29.55 that is 5 seconds before markets close. 1) Can we place AMO MIS order with stoploss and target using kite? 2) what is 1) price and 2) trigger in case of stoploss order? 1. Yes, if you have enough margins. Can we place pre-market order for F&O segment i.e. from 9:00 AM to 9:08 AM as we can do it for equity ? No. Pre market session is only for the Equity segment. suppose i place AMO order on 20th october at 5pm and trade not executed on 21st october , so i want to know when AMO order will cancel which i placed on 20th october ? I always want to buy/sell share in pre market session but find difficulties in placing order on exact time i.e 9:00:00 AM. So please let me know as how to get the exact time(live) of NSE/BSE with accuracy of milliseconds. Actually I want to match my clock time as per BSE/NSE time. Manowar, it tough to manually match this to the exact start. Is it possible to automate the order sending at 9:00:00 am through algorithmic trading or through any other Zerodha’s software/trading platform so that orders hit the exchange at sharp 9:00:00 am and are first in the queue ? Does Zerodha provide any such facility ? Not really possible, at the first tick everyone gets into a queue. No algo for this as such. How to place a premarket order? Sir, I’m a newbie to stock market. I’m facing problem on placing orders of penny stocks such as Birlacotsyn. Even if I place order previous day evening, the order doesn’t get executed and finally gets expired around 3:30. Is there any specific trick/shortcut to buy/sell penny stocks? Is it due to disclosed quantity, which I never entered for any stock while placing order? Unless your price arrives on the exchange, not guaranteed way to execute orders. Very tough when trading penny stocks which typically keeps moving in circuits. What is the validity of AMO? I am currently using icicidirect.com and they provide VTC facility so the order can be place for very long time period. i.e. 15 days. Is this same with zerodha also? No Jaydev, currently AMO is valid only till end of next day. Can we place am MIS order for equity in pre-market session and in AMO? I had placed a market order (CNC type) post market at 3:57 PM today, but “Order Book” is displaying “Order Type” as “L”, whereas i think it should have been displayed as “M”. Let me know if you want me to send a screen of this is a bug, or correct me. Thanks. In post market, market orders are not allowed. All orders can be placed only at closing price, so it automatically becomes limit price. I have bought 50 shares 1 week ago and are currently in my holdings. If I place a CNC sell request using AMO with some limit for those shares, will it get sold from my holdings or will be considered as intraday trade and I have to buy them again the same day to book profit ? If you use CNC, it will be considered as if you are selling from holdings. Yes, you can buy back as CNC again, it will become an intraday trade. Sir, I am new to this field Please clarify my doubt. 1)If i purchased a particular company share on 21st november at 6:00 pm as CNC Product type In AMO, Then Closing price of that company share on 21st november is considered or next day opening price of that company share on 22nd november is considered?? 2) Can we do Buy/sell of GROUP B,XC,XD,XT company stock in AMO? 1. Your stock will get bought at the opening price on 22nd.